As we dive into the final months of this year, many of your thoughts will be turning to a new year, resolutions, and a new beginning. The New Year is a well-known time for us to plan a fresh start, but is it the most logical? Perhaps not, when we think to the seasons. With this in mind, spring is the season that becomes our obvious choice for this fresh start, being so full of new life and signifying the re-awakening of nature from its wintry slumber. In the past I have always used this time to make my fresh start, and intentions for the year. However, this year has been different. The last ten months flew by in a whirlwind with the completion of my degree and my clothing line beginning to take shape. I feel that, quite without realising it, I’ve stumbled past spring, summer and autumn without truly taking a moment to think about whether the path I’m running along is the right one. Now, winter is beckoning to me and I look to it with delight. It is not demanding the big changes and to-do lists that a conventional fresh start may require, it simply suggests I stop, and take note. This is the season in which nature pauses, so shouldn’t we too? It does not rush to be something new and exhilarating after the boldness of autumn’s colours. Our grey skies are peaceful, the sun hanging low, and commanding no hurry within your day. It is with this in mind, and a constant reminder through my window, that I begin anew as winter draws near. Questions I’ve been asking myself will now be answered, however long it takes, and my intentions for the coming year refreshed. This is the season to think, to read, to write, and to slowly implement those little changes that will bring about your goals. But there is no hurry, no deadline. So pause, and breathe, feel the crispness of the air on your skin, and make that your fresh start this season. All images courtesy of the very lovely Annie Spratt, unless otherwise stated. 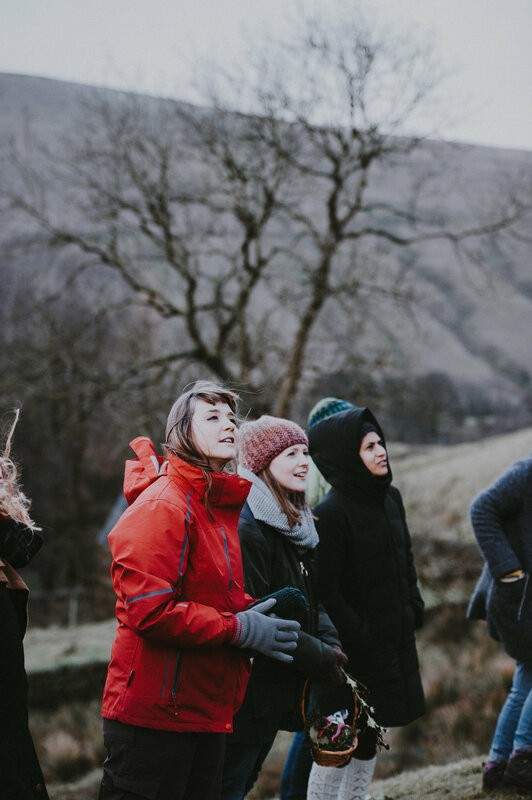 I can't quite believe it's taken me over three weeks to formulate the words to tell you about the very first Creative Countryside Winter Gathering. What began as a late night musing on Instagram led to 18 of us holed up in the Peak District for the first weekend of the new year. It was rejuvenating, inspiring, incredibly hard work(! ), and taught me so much about how I want to build this community from now on. My sister, Jess, came along as my indispensable co-host, and we arrived mid-afternoon on the Friday at Dalehead Bunkhouse, near Edale, to set up. Darkness steadily rolled in as we decorated with greenery and prepared for the first attendees to arrive. I'd chosen a location nearby a train station (I don't know about you, but arriving by train always feels a bit more stress-free), and after a couple of pick-ups we were settled for the night. We began with cider bellini cocktails (which turned out to be a bit more lethal than we'd imagined...) and coupled with a roaring fire, they helped encourage the group of strangers to bond and connect. Before dinner, Mugdha from Kindred & Kind led a herbal tea talk and tasting, and as someone who absolutely hates licquorice, the blend that included it was surprisingly delicious! Jess and I then got on with food preparations, before leading everyone through to feast on creamy mushroom and herb pasta followed by mulled winter fruits and spiced gingerbread. Conversation flowed in the candlelight and slowly people moved up to bed, or closer to the fire for late night reading. Sleep eluded me that night, but we were up early to make the most of the day. Just as the sun was rising, Elizabeth led an inspiring meditation with around half the group. I've always struggled with the concept, but her advice that you're supposed to get distracted, that it's coming back to focus that's of most importance, really rang true. The flames of the fire crackled and popped as we were still with our thoughts and Elizabeth's guidance. The second half of the group had left early to explore the hills, and returned just in time for buckwheat pancakes for breakfast. I managed to escape for half an hour or so to explore with my camera, and it was wonderful to see so many others doing the same, despite the early hour. Creative Countryside's online editor Chelsea then led us over the hills and through the valley on a mindfulness walk. The brief rainstorm lent even more meaning to her words, as were guided to take note of the feel of the mossy wall, acknowledge our senses, and connect with our emotions. A potential stumbling block - a deep boggy pit right next to a stile - was avoided thanks to the characterful farmer who let us walk down his track, albeit with the caveat, "Don't make a habit of it!" We returned with handfuls of foraged greenery, a few berries, and skeletons of winter grasses, ready to begin our foliage crown workshop, led by Jess. Event bags were handed out, and included craft aprons from Pursuit England, a luxurious green bath potion from Magic Organic Apothecary, lavender firelighters from Rebecca Fletcher, The Almanac by Lia Leendertz, and smudge sticks to cleanse the air from Kindred & Wild. Lunch was a warm cumin roasted carrot and lentil salad, with a cashew nut cheese that I'd never made before, which turned out to be incredibly popular! It was followed by two workshops: pouring our own beeswax candles, and learning all about the process from Francey at Tea and Wildflowers, and a very relaxed mini wreath-making session. It was wonderful to watch as some became engrossed in the creative act of wreath design, and our candles took on so much more meaning once we'd added our words to the glass jars - all taken from Shakespeare's Twelfth Night. Before our Twelfth Night feast, we ventured out into the half-darkness to wassail. After wishing each other wassail (or 'good health') and taking a sip of mulled organic Wyld Wood cider from the antique cider mug, we poured cider onto the roots of an apple tree I'd brought from our orchard at home, adding a cider-soaked piece of toast into its boughs, hoping for a prosperous apple harvest for the year ahead. The ceremony then moved on to a raucous session of banging pots and pans to rid the air of evil (insect) spirits, and we closed by eating an apple from my orchard at home, and I encouraged everyone to plant the core and start their own apple-growing. The temperature had dropped and we returned indoors. Our handmade beeswax candles decorated the table, and we feasted on spiced celeriac soup with za'atar, honey-roasted vegetables with quinoa and pesto, and mini apple crumbles. We lingered at the dinner table before venturing outside again to do a spot of stargazing. 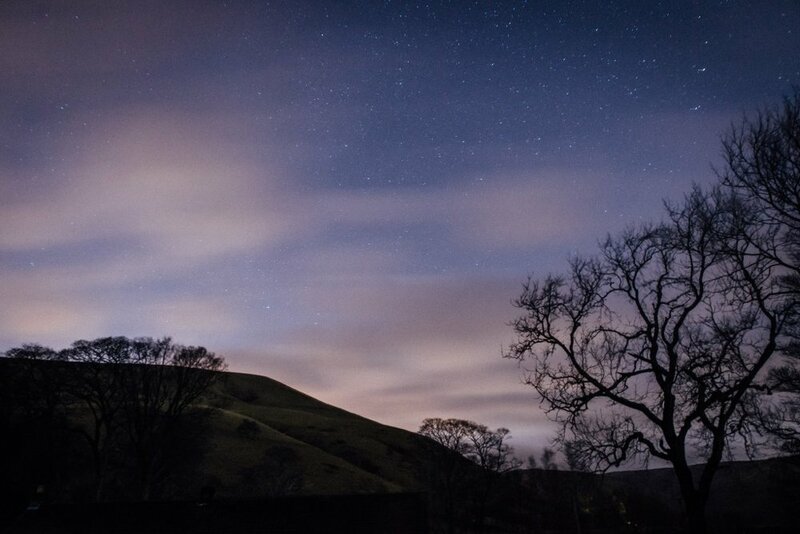 Shooting stars flashed across the sky as we picked out constellations and attempted to take photographs. Our final morning began with a few heading up to Mam Tor to watch the sunrise. The rest of us grabbed a bowl of Nordic spiced porridge and packed up the last of our possessions. A few left early with a long drive ahead, but we stayed awhile in Edale, exploring the village and surrounding fields, and enjoying a hearty pub lunch before saying our goodbyes. I'm not brilliant with texting people back or replying to emails immediately, and I definitely haven't done half the things I've wanted to with the online Creative Countryside community so far, but in a way these real life meet-ups are the antidote to all of that chaos. I met Chelsea for the first time, and Sarah, our folklore editor, too. So many of the people that attended have been involved in the magazine. And some I'd never really chatted to before. It was a real mix of truly interesting creatives, and I'm so grateful to have had the chance to get to know them more. At this time of year when the grey and moody language of winter sets the tone for the month of January, I find myself in need of a little nurturing for the soul. Mornings covered in frost, the light glinting on the horizon through a sea of fog and the glow of Christmas past make me long for the tiniest glimmer that spring is on its way. However, I’ve found that for me the best antidote to a bad case of January blues is to try to embrace what the season may hold and savour winter’s last hurrah. Heading off into the woods for the weekend, our little family of four did just that. Off the beaten track in the New Forest is Warborne Farm, a family-run 100 acre farm which boasts a selection of lovingly converted boutique barns. Perfect for retreats, families, couples and those who need nothing but cosiness, long walks and a chance to while away the hours in the wilderness of the forest. Arriving after dark, The Grain Loft, our home from home for the weekend was lit up with the glow of a roaring fire within the woodburner. Warmth, cosiness and the rustic feel of natural materials intermingled with exposed piping and industrial chic set the tone for the décor. Handmade to perfection - from the sheep fleeces on the beds from the farm’s own flock and light fitting made from the original pulley system used for hauling up hessian sacks of grain for storing, to shutters handmade by Kate’s mum Ann, bedside tables carved from blocks of Douglas Fir from the New Forest and sills once part of an old sunken barge found emerging from the mudflats. Modern, rustic but luxurious to boot. Everything has been created with an ambience of slow living in mind, helping guests to switch off from the hustle and bustle and reclaim time for themselves. Perhaps one of the most special and unexpected features of our stay in The Grain Loft was a viewing window in the floor of the sitting room, from which we could watch and marvel at our neighbours below – a family of Boer goats. I cannot tell you how magical it was to being able to witness the sweet scene beneath our feet. I’ve never felt more like Heidi. Dragging ourselves away from goats and mugs of bedtime hot chocolate, the girls’ bedroom proved to be the stuff of little girls’ dreams. Former stalls in the loft have been converted into a stunning 4 berth dorm complete with beds furnished with hay mattresses made from ox-eye daisies, ladies bedstraw and other wild flowers from the farm’s meadows. Our bedroom didn’t disappoint either. Soft sheepskin and downy pillows ensured a night of dreaming we were snuggled up in a chalet deep in the snowy Alps. It’s these beautiful little touches which make staying at Warborne so magical. A cavernous copper bath and time spent reading and chatting by the fire with a large glass of wine ensured the perfect digital detox. Waking to a day of planned adventures, the surrounding heathland ensured that we had time to daydream whilst spotting wild ponies, collecting pine cones and getting muddy and rosy-cheeked with our dogs. There’s also the seaside town of Lymington to explore if you wish to venture out for supplies and take a bracing walk along the sea walls. However there’s heaps to draw you back to the farm. Picking your own organic vegetables from the plentiful polytunnels, finding buckets by the front door with treats to feed the farm’s Kune Kune pigs and being able to collect your own eggs for breakfast from the hen house are all highly recommended. We loved savouring the simple things and enjoying the beauty of midwinter at its best. No need for screen time, although there are televisions and Wifi in each of the barns should you not be able to resist. Our little ones spent hours just running about, visiting the farm’s many animals and bouncing off the top of the bales in the hay barn.